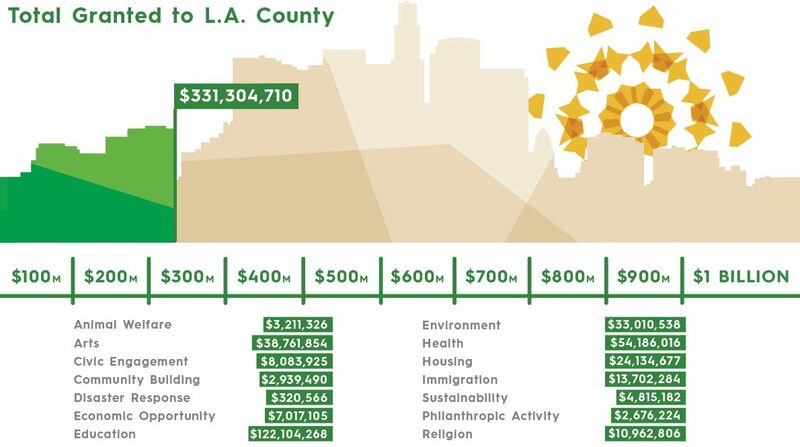 Grant $1 billion to L.A. County nonprofits over the next 10 years. Since this pledge was announced in 2015, we and our donors have given more than $331 million to thousands of organizations and causes in Los Angeles County. Whether for health or education, animal welfare or the arts, these gifts improve the quality of life for our neighbors and create a stronger future for our children. Provided services and scholarships allowing more than to 33,000 students to prepare for, pay for and graduate from college. Granted nearly $50 million to support community clinics, expand access to physical and mental health care and support advocacy, outreach and education for a healthier L.A.
We can’t achieve this goal on our own. It depends on the limitless passion, generosity and creativity of Los Angeles donors, nonprofits and community and government leaders. It owes its success to the dedication all of us feel to build a better future for our children and grandchildren. Together, we can face L.A. County’s greatest challenges, and together we can realize its potential.